“The Marshmallow experiment” by Clinical Psychologist, Walter Mischel. The treats were left right in front of the kids during the tester’s absence. Some were barely able to wait a couple of minutes before they gobbled up the treat whilst others were able to wait considerably longer. They were less likely to have been involved in drug use and overall had more successful lives. What does this mean for your business and your life? There are going to be distractions, many of them, and your ability to tune them out and focus on your priorities will impact your results. Commit to specific SMART goals and work towards them. The more self-control you exercise, the more consistent your work and the sooner you will see results. Importantly, are you teaching your children self-control and how to exercise their willpower. You may think you’re showing them love by pandering to their every whim but you’re really only hampering their long-term success. “The Memorizing Experiment” by Marketing Professor, Baba Shiv. In a 1999 experiment Baba Shiv carried out a simple experiment on 165 graduate students. Half the students were given a 2-digit number to memorize and half a 7-digit number. The students were then asked to walk to another room where they would recite the number. En route they were offered a treat as a thank you, either a fruit salad or a chocolate cake. The results were startling: students who were holding a 7-digit number in their head were 50% more likely to accept the chocolate cake. Their thinking power was being used up by trying to remember the number so they were less likely to choose the healthier snack. If you think about your brain as having two decision-making areas - a rational thinking brain and an emotional brain - then it makes sense that if your rational centre is busy your emotional centre will take over. Your willpower can be drained by unrelated exercises. Let’s say you’re trying to build a business whilst you’re still in a regular job and you’re dieting at the same time. 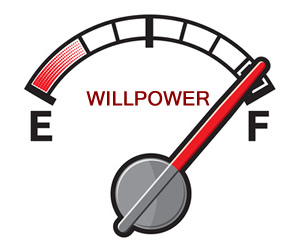 If you have been resisting food all day by the time you get home your willpower to work on your business may be low. Instead of the three hours of work you have committed to, you might find yourself completely unable to do more than a good 45 minutes. In summary, the secrets to success are a lot simpler than you might think. Refining your character traits such as willpower, self-control and the formation of good habits plays a much more important role than you realize in your financial and life success.